When it comes to buying a Electric Bike to trust with your life; WHO you buy from is just as important as WHAT you’re buying! Please CLICK HERE to understand why. 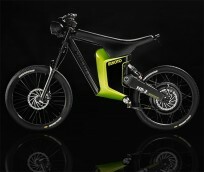 The electric bikes for sale from Joy Ride Motors combine the best of both worlds! You can have the versatility and convenience of a bicycle with the engine power of electric motor bikes. Inexpensive (but not cheap) electric bikes from Joy Ride Motors are just the thing you need for a non-freeway commute or for riding around town. Our electric powered bikes are designed as a lightweight alternative to scooters and motorcycles, coming in at just under 100lbs. They run on a 2KW engine with lithium battery packs, which last about 50 miles without a charge (and cost only $1 to charge!). If you live a short distance from work that is too far to walk, or if you rarely need use of a car, our electric bikes are the cost-effective solution to keeping up maintenance on an expensive vehicle. They reach a maximum of 30mph, so of course you would never take it on an expressway or busy highway – but anywhere a bicycle can go, you can take your electric bike (only you’ll be going a lot faster). We offer a much lower price on our electric bikes than the MSRP, and additionally, we charge no shipping or handling costs on any orders. That means the price you see on the product page is the exact price you will be paying – no extra charges or fees (it’s just the way we roll). Your order is processed fast – from 3 to 5 Business days after it is placed online – so you can enjoy your new purchase as quickly as possible. If you ever have any questions about our electric bikes, trikes, scooters, go karts, or dune buggy selections, please do not hesitate to call us. Help is just a simple phone call away. You can easily contact one of our well-informed staff members today toll-free at 877-300-8707. Joy Ride Motors' electric bikes for sale are an amazing value that is inexpensive but not at all cheap!